All needles are angled at the tip as well as the base of the needle configuration in order to give your clients the maximum comfort available. This unique patented technology is called the Comfort System. The Comfort System comes in angled straight-line configurations as well as round configurations. Angled straight-line configurations come in single row, double row, triple row, quadruple row, and 6 row configurations. Round needles come in extra small (3 prong), medium (8 prong), large (15 prong), and extra large (36 prong) configurations. In addition, you have the choice between three kinds of pens: completely disposable pens such as the blue C28 pen (C designates the full, one piece pen), needle tips such as the ct24 (ct stands for "click tip") which can be combined with the blue fish sticks or blue click sticks in order to make your own pen, or the original foil cartridge system. The way you use pens, click tips or cartridges to do permanent makeup is completely up to you. The gauge is the thickness of each individual needle. We have two different gauges that we use in our needle configurations, regular and extra fine (12 gauge and 8 gauge). Regular gauge needles are a good choice for most skin types, and create a very natural look. Fine gauge needles can be set much closer together than regular gauge needles because they are not as thick. These needles are more flexible and are used to give a more defined look. For example, a 10 prong fine needle is often used to create a very defined, fine outline for lip lines and thick eyeliner. Regular gauge needles such as the 12 prong are better suited for filling in eyebrows etc. The following will describe the various uses of the Comfort System needles. Keep in mind that these suggestions are our favorite uses of these needles. You may find your own favorite uses for these needles. Some of the uses of these needles will overlap. For example, you will find that a 24 extra fine needle can be used for eyebrows, eyeliner, and lip liner. Tapping should mostly be done in the same place unless a more natural effect is desired. 10-15 taps in a given area is usually sufficient to implant color permanently. Everyone's hand is different. As a result, the lighter handed professional will need to tap more times than a heavier handed professional. If you want a more natural look, then random tapping while moving over the desired area will give you what you need. For individual hair stokes, then 20 taps in the same exact spot may be required. If you are using the SofTap® colors then stop tapping in the color once you see the color saturation that you desire. This is one of the great advantages of the SofTap® colors. As soon as you like what you see, stop implanting color. For more information on our revolutionary no-mix SofTap® colors, see our Color Guide. 5-prong (brown) This single row needle configuration is excellent for very very thin eyebrows or for short hair strokes on the tails of the eyebrows. If you desire longer hair strokes, just line up your hair strokes one behind the other. 7-prong (red) This single row needle configuration will give you a slightly thicker eyebrow than the 5 prong. It is also excellent for the tails of eyebrows. 9-prong (blue) This single row needle configuration is one of our most popular sizes for medium width brows. 10 prong (yellow). The 10 prong fine single row needle configuration is an excellent choice for fine hair strokes on eyebrows. This has an extra fine gauge on the needle width and gives the best and thinnest hair simulation. This can be used in conjunction with the 9 or 12 prong needles, which will give you slightly thicker hair strokes. This can also be used with our 14 prong curved needles, which give you an instant curved line. 12 prong (green) The most popular configuration in the SofTap® needle collection! 12 prong needles are commonly used for hair strokes and solid fills in medium thickness eyebrows. 14 prong curve (turquoise) This needle configuration is used differently than all of our other needles. This needle is used sideways and with each tap you instantly get a curved line tapped into the skin. This is a great needle for individual hair strokes that look more natural because they are curved. This needle has five functions. It can be used sideways and then flipped over the other side to create a different curved line on the same eyebrow. In addition, you can use only half of the curved line for shorter hair strokes on the tail of the brow. You can use the front half for one shape of a curved line or the back half for another shape of a curved line. This needle can easily create the bulb or front of the brow with as little as 3 strokes. It can also be used the same way that all of our other needles are used to create shorter lines. 16 prong curve (orange) This is a fine gauge curved needle that is used in the same fashion as the 14 prong curve. The 16 is an excellent choice for finer hair strokes in thinner eyebrows. 15 prong (red) The 15 is a round configuration at an angle and is best for a soft fill in of color. 24 prong (turquoise) The 24 double row of 12-needle configuration is an extra fine gauge needle. It is an 8-gauge needle, which means that more color will be deposited in a smaller area. For a more filled in look, this is very popular. 28 prong (dark blue) This double row of 14-needle configuration can be used for filling in eyebrows quickly. 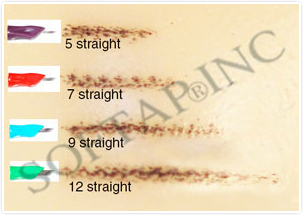 There are many different effects that can be created with the SofTap® needles for eyeliner. Tapping in the same place with 30 or so taps will yield a beautiful eyeliner with minimal to zero touchups required. The following needle configurations will explain the various effects that can be achieved for the eyes. 3 prong (purple) The 3 is a round configuration and is an excellent choice for a bottom eyeliner where the client does not desire a lined look. This gives a smudgier, softer, "barely there" look. Place color only at the base of the eyelashes and tap 20-30 times at the base of each lash. 10 prong (yellow). The 10 single row needle configuration is an excellent choice for a super fine line. 5,7,9, or 12 prong Best for a thin upper or lower eyeliner. The bigger the number on the needle, the longer the line will be. Some feel more comfortable implanting a shorter line while others prefer the longer line that is created with the bigger numbered needles. Using a 12 prong needle can be more than twice as fast as using a 5-prong needle. Super Smudger (green) This is a single straight-line needle configuration with every other needle missing. There are 7 needles in this assembly. This is the best needle to use for a soft smudgy look. This will give you a softer look than the round configurations because there is more space in between the needles. This look can be created with a very fine line on the lower lid, or it can also be used if your client desires a smudger look on the outside edge of the upper and /or lower liner. For example, let's say that you do a lash enhancement with the color Mahogany, but the client desires a softer, smokier outer edge. This can easily be accomplished with the super smudger and randomly tapping in the outer 1/3 of the eyeliner area. This can be done with the same color diluted with distilled water, a lighter undiluted color or even with a different color that brings out the eyes such as Jade Granite or Irish Moss for green eyes or Blue Lagoon mixed with a little bit of Pearl for blue eyes. 8 prong (pink) The 8 is a round configuration that is excellent for a thin softer lower liner. This will give you a softer line rather than a straight-line configuration. 15 prong (red) The 15 round is excellent for a medium/thick softer lower liner, but most popular for a soft upper liner. 18 prong (dark purple) This is a round configuration that is excellent for a medium, but dense soft lower liner. 24 prong (turquoise) This double row of 12 needle configuration is best for an upper or lower eyeliner where the thickness desired is slightly thicker than using a single row 12 gauge needle. Also because this is a extra fine gauge needle (8), the color implanted will be more intense and denser than a needle with a 12-gauge thickness. 84 prong (salmon pink) The 84 is a 6-row needle configuration of 14 needles. This is a great needle configuration for upper eyeliner for someone who desires a very defined and thick liner. The extra fine gauge gives the density of color while the multiple rows give you width. An excellent needle to use for tapering the inner and outer portion of the line is an 18-prong needle (dark purple). 24-prong (turquoise) The 24 is best for an thin to medium lip line. 84 prong (salmon pink) The 84 is a 6-row needle configuration of 14 needles. This is a great needle configuration for a lip fill in. Do one section at a time. Remember that it takes about 5 times as much tapping on the lip fill as it does on the lip line, eyes, and brows. This is a good choice for small to medium sized lips. 114 prong (pink) The 114 is a 6-row needle configuration of 19 needles. This is a great needle configuration for a lip fill in. Do one section at a time. Remember that it takes about 5 times as much tapping on the lip fill as it does on the lip line, eyes, and brows. This is a good choice for medium to large sized lips. 36 prong (blue) The 36 is a round cluster that you may also prefer to fill in lips. Keep in mind that many prefer the finer gauge needles for lips because there is less bleeding. However, many find that this 36-prong needle works beautifully for the fill in of the lips. We suggest that you try both kinds and see for yourself. 56 prong (dark orange) The 56 quadruple row of 14-needle configuration is also used for lip fill using a criss-cross tapping across the fill of the lip.